Originally from Denver, Colorado, Gabriel Mark Hasselbach has found a West Coast lifestyle, and musical expression in the beautiful city of Vancouver British Columbia. He plays trumpet, flugelhorn, valve trombone, flute, and alto flute, (a virtually unheard of feat), and is considered Canadas foremost exponent on electronic wind instruments. Mark is well versed in all styles of music, with jazz being his main love. He can be heard in many styles and contexts, not only on his own nine CDs. but on a myriad of album projects by various artists (John Denver, Diamond In the Rough, Alibi. Long John Baldry, Jim Byrnes, Vancouver Ensemble For Jazz Improvisation, The Good Bros. etc.). He has even had the opportunity to perform in the bands of such legends as Little Richard, Mary Wells, The OJays, Long John Baldry, Ben E. King, and Heart. Solo career aside, he is well known to a wide audience through his long association with Canadas multi-platinum recording group, The Powder Blues. This band has the distinction of having the largest selling crossover blues album in Canada, and was the darling of the international blues circuit. His stay with that ensemble encompassed all seven of their albums and brought critical acclaim and subsequent world tours, as headline act themselves, as well as tours with such mega-stars as the The Who, ZZ Top, Bob Seger James Cotton, Stevie Ray Vaughn, Tower of Power, etc. While with Powder Blues, Gabriel Mark was awarded a JUNO Award in 1980 (Canadian equivalent to a Grammy) for Most Promising Group. He has also received the Ampex Golden Reel Award. The West Coast Music Award, and several gold, platinum, and double platinum record awards. 1988 saw Hasselbach and his touring band in Australia performing at Expo 88, where an hour-long concert video was taped and subsequently broadcast in Australia and Canada. 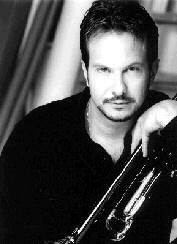 Mark has also toured Japan, the U.S., Mexico, and Canada extensively. He has been fortunate enough to perform at the prestigious Montreux Jazz Festival in Switzerland. and the North Sea Jazz and Blues Festival in Holland. Canadian highlights include performing on the nationally televised JUNO Awards show and headlining at the National Arts Centre. Ottawa. In 1997 Mark was featured at MusicFest in Ottawa, and had the honor of performing in the All Star Big Band led by Tommy Banks. Among the luminaries on board were Louie Bellson, Pete Christlieb, Guido Basso, Phil Nimmons, Pat La Barbera, The New York Voices, Denny Christianson, and others. That year, Gabriel Mark and his full 22 piece orchestra performed for the opening of the new Vancouver Airport as well as Canada Day Celebration at Canada Place. GMH has continued his musical odyssey by branching out into the realm of film, commercial, and multimedia music. He has done hundreds of radio and television jingles for such diverse clients as Sony, Kentucky Fried Chicken, Pontiac, General Motors, National Geographic, Mc Donalds, and a host of others. His music has been used in films such as Double Jeopardy, Breach of Trust, and Crash; television productions such as Lifestyles of the Rich and Famous, and Mating Calls in the Urban Jungle; in animation such as Canvas Cat and Bongo Bat; and in multimedia projects such as Vision Masters Multimedia Collection. His music underscores fashion shows, industrial and motivational films, corporate events, and all manner of audio visual projects. He has his own 24-track digital production center with digital mastering lab and live recording area. Although fully versed in state of the art digital music, Marks roots as a brass and woodwind player allow him to create all manner of offbeat and unique audio projects, drawing upon world music and Americana, both Native and European influenced. In the spring of 2000, Mark recorded a live album at the famed Maui Arts and Cultural Center on Maui, Hawaii, and this exciting performance has been captured on CD and on an hour long video special for BET On Jazz worldwide, which remains in heavy rotation in 41 countries. His latest album Ubersmooth kicks off with Turn On To Summer in June 2001, and has tour stops planned in Hawaii, Florida, Georgia, Colorado, & Washington, to name a few. Jazz and the spirit of improvisation, has been a constant thread in my life and career, my deepest and most satisfying passion. In this age of specialization, it is a challenge to be a specialist in diversification, yet this is where I find myself. Programmers and listeners would like to neatly categorize me and my music with such easy to swallow handles as jazz trumpeter, and would love for me to come attached to an easily recognizable signature sound. The truth is that I have a variety of skills and a fondness for many styles of music, and treat the many instruments I play as implements of color and texture, as would a graphic artist. My earliest brushes with jazz came during the late night listening on my transistor radio, under the blankets, in my birthplace of Denver, Colorado. The great organ trios and bop masters would bounce off the ionosphere to my mile high location from jazz hotspots such as Chicago and Detroit. My first private teacher was a jazz bassist, and subsequent school band teachers were working jazz pros. My first foray into record collecting came by way of a record club. I was profoundly influenced by these first six vinyl records: Blue Notes Three Decades of Jazz, Herb Alpert and the Tijuana Brass, Sergio Mendez and Brazil 66, Jefferson Airplane, James Brown, and Kentons West Side Story. My early influences continue to serve me well throughout my career. I have had the opportunity to perform, tour, and/or record in a myriad of styles with artists like Heart, Little Richard, John Denver, The OJays, Tommy Banks, Jim Byrnes, Diamond In The Rough, Mary Wells, Michael Buble,VEJI, and Dionne Warwick, as well as a host of unknown hopefuls. I have six albums under my own name, three under my new age nom de plume Gabriel, and five as an original member of Power Blues (several of which have earned Platinum status), as well as having recorded with a variety of recording acts. I have been blessed with several JUNO awards, West Coast Music Awards, Technics Allstar Band Award, and the Ampex Golden Reel Award. Good fortune has allowed me to tour the world. I have been fortunate enough to have performed at such prestigious venues as the Montreux Jazz Festival, the North Sea Jazz Fest, and the National Arts Center. a conscious effort to paint a more complete picture of my contribution to the world of music. It is also a challenge to radio programmers who, not always able to honor the spirit of the evolution of jazz, must work within preordained radio formats. Choose the tracks you like and play them! I am hoping that my signature sound is something that can be heard in every note I play regardless of instrument. Mostly, I just hope you can appreciate my creative scope and enjoy the music.